Though I had mixed feelings about the first season of Mad Men, which I picked up at Half Price Books for a steal, I still found enormous appeal in the more drawn out experience of the series unfolding. Movies lately have been leaving me tragically unmoved, with those in the action category being far too noisy and preposterous and those in the drama one too brief to establish any significant emotional investment in the characters. In a series, though, especially those in the new style pioneered by The Sopranos which eschew efforts to wrap up their plots by the end of each episode, viewers get a chance to follow characters as they develop, and the resultant investment in them makes even the most underplayed and realistic violence among them excruciatingly riveting. So, even though I found Pete Campbell, an account executive at the ad agency Sterling Cooper, the main setting for Mad Men, annoying instead of despicable, and the treatment of what we would today call sexual harassment in the office crude, self-congratulatory, and overdone, by the time I had finished watching the first season I was eager to get my hands on the second. I’ve now seen the first four seasons. “The writing is extremely weak, the plotting haphazard and often preposterous, the characterizations shallow and sometimes incoherent; its attitude toward the past is glib and its self-positioning in the present is unattractively smug; the acting is, almost without exception, bland and sometimes amateurish. I have to say Mendelsohn is right on the mark here—though I will take issue with his categorical claims about the acting—leaving us with the question of why so many of us, me and Mendelsohn included, find the show so fascinating. Reading the review I found myself wanting to applaud at several points as it captures so precisely, and even artistically, the show’s failings. And yet these failings seem to me mild annoyances marring the otherwise profound gratification I get from watching. Mendelsohn lights on an answer for how it can be good while being so bad, one that squares the circle by turning the shortcomings into strengths. Mendelsohn’s clever solution to the Mad Men puzzle is that its appeal derives from its child’s-eye view of the period during which its enthusiasts’ parents were in their ascendancy. The characters aren’t deep because children wouldn’t have the wherewithal to appreciate their depth. The issues aren’t explored in all their complexity because children are only ever vaguely aware of them. For Mendelsohn, the most important characters are the Drapers’ daughter, Sally, and the neighbor kid, Glen, who first has a crush on Don’s wife, Betty, and then falls for Sally herself. And it turns out Glen is played by Weiner’s own son. I admit the episodes that portrayed the Draper’s divorce struck me as poignant to the point of being slightly painful, resonating as they did with my memories of my own parents’ divorce. But that was in the ‘80’s not the 60’s. And Glen is, at least for me, one of the show’s annoyances, not by any means its main appeal. His long, unblinking stares at Betty, which Mendelsohn sees as so fraught with meaning, I can’t help finding creepy. The kid makes my skin crawl, much the way Pete Campbell does. I’m forced to consider that Mendelsohn, as astute as he is about a lot of the scenes and characters, is missing something, or getting something really wrong. In trying to account for the show’s overwhelming appeal, I think Mendelsohn is a bit too clever. I haven’t done a survey but I’d wager the results would be pretty simple: it’s Don Draper stupid. While I agree that much of the characterization and background of the central character is overwrought and unsubtle (“meretricious,” “literally,” the reviewer jokes, assuming we all know the etymology of the word), I would suggest this only makes the question of his overwhelming attractiveness all the more fascinating. Mendelsohn finds him flat. But, at least in his review, he overlooks all the crucial scenes and instead, understandably, focuses on the lame flashbacks that supposedly explain his bad behavior. All the characters are racist, Mendelsohn charges. But in the first scene of the first episode Don notices that the black busser clearing his table is smoking a rival brand of cigarettes—that he’s a potential new customer for his clients—and casually asks him what it would take for him to switch brands. When the manager arrives at the table to chide the busser for being so talkative, Don is as shocked as we are. I can’t recall a single scene in which Don is overtly racist. Then there’s the relationship between Don and Peggy, which, as difficult as it is to believe for all the other characters, is never sexual. Everyone is sexist, yet in the first scene bringing together Don, Peggy, and Pete, our protagonist ends up chiding the younger man, who has been giving Peggy a fashion lesson, for being disrespectful. In season two, we see Don in an elevator with two men, one of whom is giving the raunchy details of his previous night’s conquest and doesn’t bother to pause the recounting when a woman enters. Her face registers something like terror, Don’s unmistakable disgust. “Take your hat off,” he says to the offender, and for a brief moment you wonder if the two men are going to tear into him. 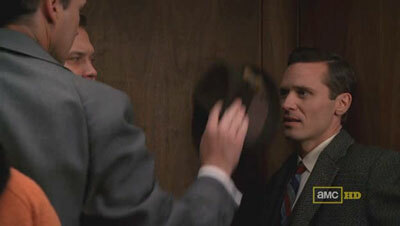 Then Don reaches over, unchecked, removes the man’s hat, and shoves it into his chest, rendering both men silent for the duration of the elevator ride. I hate to be one of those critics who reflexively resort to their pet theory, but my enjoyment of the scene long preceded my realization that it entailed an act of altruistic punishment. The opening credits say it all, as we see a silhouetted man, obviously Don, walking into an office which begins to collapse, and cuts to him falling through the sky against the backdrop of skyscrapers with billboards and snappy slogans. How far will Don fall? For that matter, how far will Peggy? Their experiences oddly mirror each other, and it becomes clear that while Don barks denunciations at the other members of his creative team, he often goes out of his way to mentor Peggy. He’s the one, in fact, who recognizes her potential and promotes her from a secretary to a copywriter, a move which so confounds all the other men that they conclude he must have knocked her up. Mendelsohn is especially disappointed in Mad Men’s portrayal, or rather its failure to portray, the plight of closeted gays. He complains that when Don witnesses Sal Romano kissing a male bellhop in a hotel on a business trip, the revelation “weirdly” “has no repercussions.” But it’s not weird at all because we experience some of Sal’s anxiety about how Don will react. On the plain home, Sal is terrified, but Don rather subtly lets him know he has nothing to worry about. Don can sympathize about having secrets. We can just imagine if one of the characters other than Don had been the one to discover Sal’s homosexuality—actually we don’t have to imagine it because it happens later. Unlike the other characters, Don’s vices, chief among them his philandering, are timeless (except his chain-smoking) and universal. And though we can’t forgive him for what he does to Betty (another annoying character, who, like some women I’ve dated, uses the strategy of being constantly aggrieved to trick you into being nice to her, which backfires because the suggestion that your proclivities aren’t nice actually provokes you), we can’t help hoping that he’ll find a way to redeem himself. As cheesy as they are, the scenes that have Don furrowing his brow and extemporizing on what people want and how he can turn it into a marketing strategy, along with the similar ones in which he feels the weight of his crimes against others, are my favorites. His voice has the amazing quality of being authoritative and yet at the same time signaling vulnerability. This guy should be able to get it. But he’s surrounded by vipers. His job is to lie. His identity is a lie he can’t escape. How will he preserve his humanity, his soul? Or will he? These questions, and similar ones about Peggy, are what keep me watching. 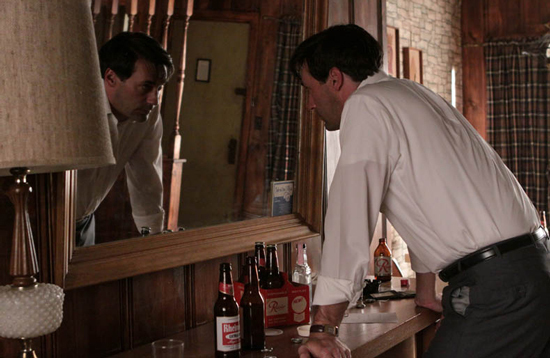 Don Draper, then, is a character from a long tradition of bad boys who give contradictory signals of their moral worth. Milton inadvertently discovered how powerful these characters are when Satan turned out to be by far the most compelling character in Paradise Lost. (Byron understood why immediately.) George Lucas made a similar discovery when Han Solo stole the show from Luke Skywalker. From Tom Sawyer to Jack Sparrow and Tony Soprano (Weiner was also a writer on that show), the fascination with these guys savvy enough to get away with being bad but sensitive and compassionate enough to feel bad about it has been taking a firm grip on audiences sympathies since long before Don Draper put on his hat. A couple final notes on the show's personal appeal for me: given my interests and education, marketing and advertising would be a natural fit for me, absent my moral compunctions about deceiving people to their detriment to enrich myself. Still, it's nice to see a show focusing on the processes behind creativity. Then there's the scene in season four in which Don realizes he's in love with his secretary because she doesn't freak out when his daughter spills her milkshake. Having spent too much of my adult life around women with short fuses, and so much of my time watching Mad Men being annoyed with Betty, I laughed until I teared up.